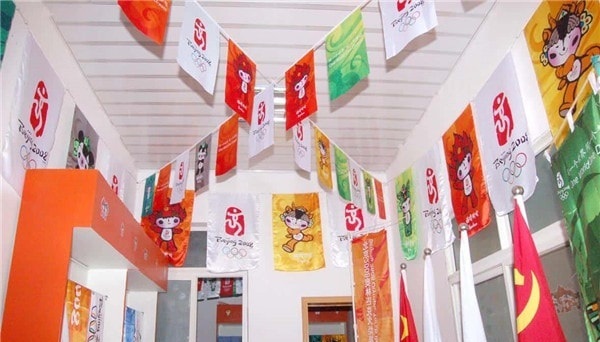 Buntings, also known as bunting flags, bunting banners, string pennant flags, string banners, mini triangle flag banners, hanging pennant banners, is a perfect medium for business advertising or eye-catching decoration. 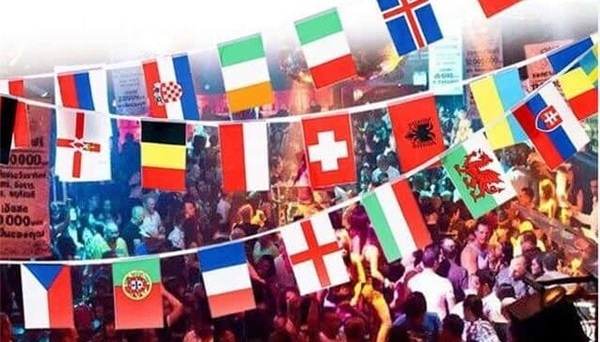 Our fabric printed buntings are excellent display in retail outlets, supermarkets, bars, clubs, shop fronts, tradeshows, festivals, any events and occasions you wish brand recognition and unique theme decoration. Suit for indoor and outdoor use. 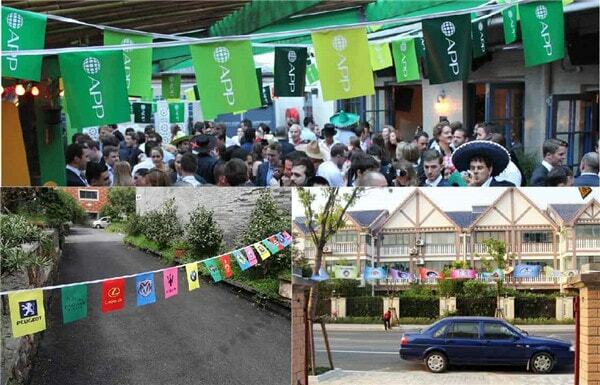 Bunting flags have been a popular and cost effective way of advertising. The custom bunting flags we made can be personalized with any color, logo or marketing message, outstanding attraction to where the sale items located and promoted. You can create your own design on these pennant flags as you wish. The great thing, is that our fabric bunting flags can be reused over and over again. 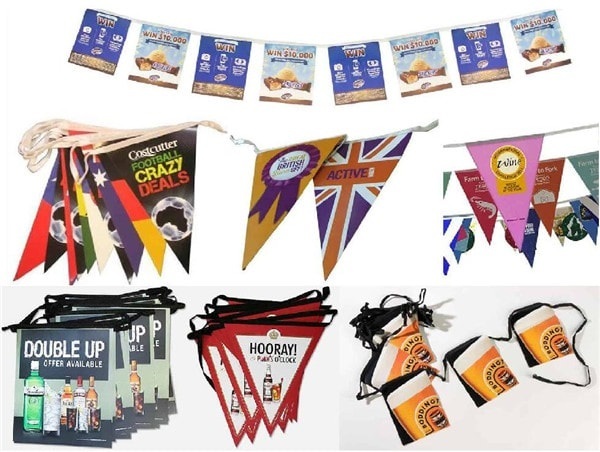 If you want branded bunting flags, our custom type would be the perfect option for you. 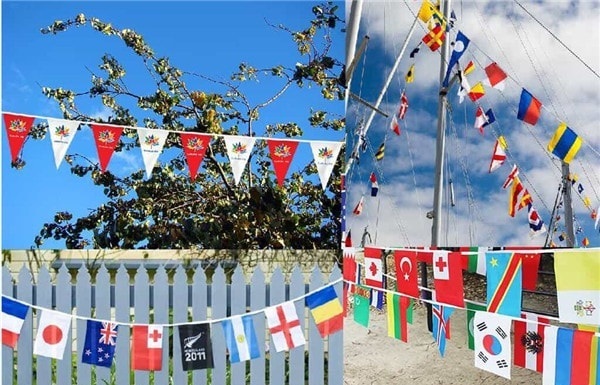 Customized with national or country flag, sports theme in the form of a string, is a very great decoration to show your patriotism and support of your sports team. 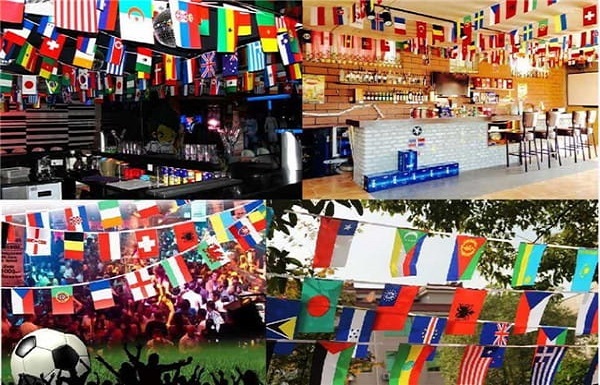 They are ideal used in the football club, festival party, theme bar, company office, school and even home. You can create as long of a bunting flag as you need. 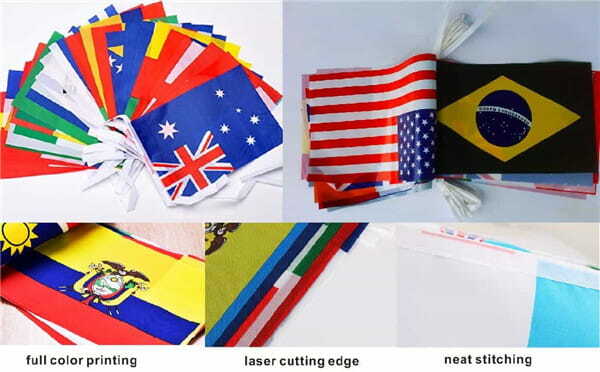 We use advanced heat transfer printing technology to produce all bunting flags in full color. This allows you to chose and design any color or complex logo, including gradient and transitional color we can also make. Standard single-sided printing will show the backside in good reverse. 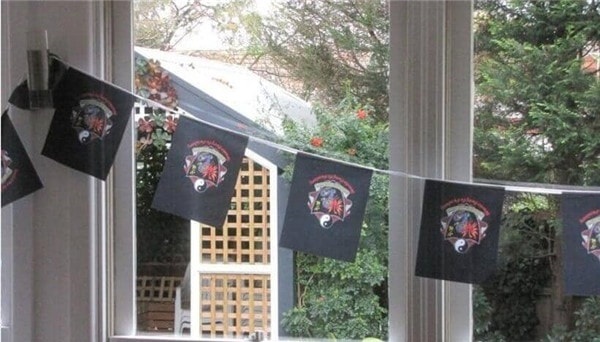 This is a very cost-effective way to print and make buntings. We can also make double-sided printing if you need, just let us know. The fabric buntings are durable and outstanding to be reused in event. Artworks are best sent as an AI or CDR vector art file. We can also print from high res JPG, PDS, PDF. We offer every customer high quality products, fast turnaround time, free design and best price. Our company is running a celebrating discount price, contact us to get a good quote. We bought these custom triangle flag banner to celebrate the Olympics. Have all the participating country flags on. Great color and good quality, we love them. Shipped right away and the package of the custom triangle flag banner was packed very well. I am so happy with it. I took them to my classroom and hung it up around the room, students love it. Custom these custom triangle flag banner for our international Christmas feast. We hung in all of our rooms. High quality and easy to install. Price is really fairs, custom triangle flag banner be reused! Such an incredibly decoration! I order as triangle flags on the custom triangle flag banner, cut it into sections and draped it across walls for a theme party, and love your wholesale cheap price, so good. These pennant banners were a great choice for our Olympic party. And I custom them with some funny ideas. They worked so well and funny, we all love them. If someone want to design and custom triangle flag banner, I would like to recommend you. This was a fantastic addition to son’s birthday party decoration. He is a nfl fan, so we custom triangle flag banner, with his favorite team logo, he was excited to have them. Cute triangle custom triangle flag banner we custom. Personalized it was also fantastic. We hung it on the classroom, excellent quality- definitely reusable! Excellent value, put these felt sports banners on the wall, great addition and decoration. The custom style make is special and fun. 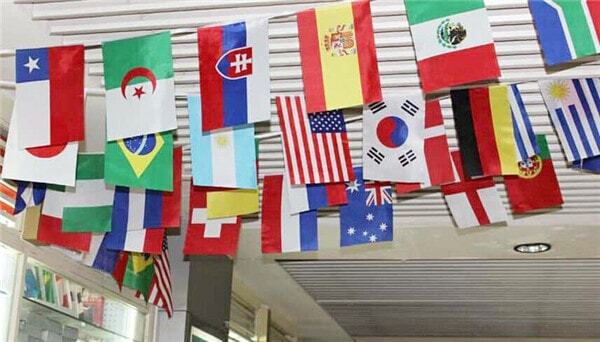 Excellent pennant string flags wholesale! My company logo looks so great on the table cover. This is an very user friendly site to pennant string flags wholesale, these logo pennant string flags wholesale have helped us along our way in promotional achievements. I am absolutely delighted so far, rewarding you with 5 stars! Excellent shopping experience online, good quality product and great price, thank you all guys! I have just received my pennant string flags wholesale, they came incredibly fast, and the printed pennant string flags wholesale look awesome. I will be using my personalized pennant string flags wholesale in my pennant string flags wholesale next weekend! Hope they would be nice display custom football pennants! Tina was so helpful and made sure that everything got done the right way. Excellent customer service, excellent delivery, on time. You guys are great! Highly recommend this site to pennant string flags wholesale! So satisfied with my soccer pennants banner for trade shows! Fast turnaround time, good customer service and good quality. Happy to buy soccer pennants banner soccer pennants banner cheap here and make my event a big success! Excellent job! I was searching an online site to pennant string flags wholesale, and finally came across this site. The customer representative was very kind and gave me good suggestion. The imprinted soccer pennants banner I received, excellent printing with my logo, great quality fabric, they are the perfect pennant string flags wholesale. 5 stars for your great job! Thanks! Copyright © 1998-2018 pennant-flags.com All rights reserved by CKFLAG.COM.